Several years ago, Wells Fargo Bank discovered that employees had boosted sales, by opening some 2 million deposit and credit card accounts without customer knowledge or authorization. Over the next few years, the bank fired more than 5,000 employees for misconduct and reimbursed customers $2.6 million in fees that they may have incurred on the bogus accounts. Insufficient response and retribution, regulators and politicians howled. They played no role in uncovering the fraud, but they are hounding bank officials and demanding $185 million in fines. In another action, the Environmental Protection Agency, Federal Trade Commission and State of California agreed to a $14.7 billion settlement with Volkswagen, to compensate 482,000 buyers who bought diesel cars that the company illegally made appear less polluting than they actually were. “This settlement shows that EPA is committed to upholding standards to protect public health, enforce the law and protect clean air,” said Administrator Gina McCarthy. But it’s just a “partial settlement,” a “first step” in holding VW accountable for breaching “the public’s trust,” added DOJ Deputy AG Sally Yates. Meanwhile, Ms. Yates wants prosecutors to employ the Responsible Corporate Officers Doctrine (or Park Doctrine) more often, to hold executives individually accountable for the actions of company employees, without requiring that the government prove the execs intended to break any laws – or even that senior managers were negligent or didn’t even know someone in the company was violating a law. Hillary Clinton is incredibly lucky the Park Doctrine doesn’t apply to her. Just imagine FBI Director James Comey’s dilemma if he couldn’t use the “no intent to violate the law” excuse. In fact, countless government officials – including Ms. McCarthy and IRS Commissioner John Koskinen – are blessed beyond measure that standards they routinely use against American citizens don’t apply to them. In fact, very few laws or regulations apply to the lawmakers and regulators who concoct and impose them. No one should be victimized by corporate fraud, negligence or incompetence. But neither should they be victimized by negligent, incompetent or criminal actions of government agencies and bureaucrats, or of third parties they hire to validate their policies and agendas. Those actions also breach the public trust. Equally fundamental and essential, policies and rules that affect our livelihoods, living standards and liberties must be based on honesty, accountability, evenhanded application, and verifiable evidence. Those basic guidelines are patently ignored today, as countless examples demonstrate beyond doubt. The IRS repeatedly abused its power in targeting conservative groups. But then Lois Lerner’s emails mysteriously disappeared, she took the Fifth and retired with full pension, “two employees on the night shift” deleted the email backup tapes (with no repercussions) and Mr. Koskinen steadfastly refuses to cooperate with congressional investigators. No Park Doctrine for any of them. Abuses are rampant throughout federal, state and local governments, as news accounts constantly attest. Incompetence, fraud and public trust violations just in the environmental arena are mind-numbing. On August 5, 2015, an EPA-hired crew negligently reopened the Gold King Mine above Silverton, Colorado and unleashed a 3,000,000-gallon toxic flashflood that contaminated rivers all the way to Lake Powell in Utah. EPA waited an entire day before notifying the public, offered apologies but only minimal compensation, refused to fire, fine or demote anyone – and issued a report that whitewashed the agency’s incompetence and even scrubbed the names of EPA on-site coordinator Hayes Griswold and his team. But it’s on the regulatory front that the duplicity, exaggeration, fabrication and betrayal of our public trust are really outrageous – and used to amass more power and control over our energy, economy, job creation and living standards, close down companies and industries that regulators detest, and advance crony corporatist deals with favored entities, regardless of costs or impacts on jobs, health and welfare. EPA is determined to make our air not merely safe or healthy, but pristine, with no human pollutants. Since 1970, US cars have reduced tailpipe pollutants by 99% and coal-fired power plants have eliminated 92% of their particulate, sulfur dioxide and nitrogen oxide emissions. That’s still not enough, says EPA. To promote its claim that any soot and dust particles are deadly, the agency employs “epidemiological” studies that attempt to link slightly higher death and pollution rates in different locales – and attribute the difference to manmade particulates. However, it is impossible to distinguish health effects due to vehicle, refinery or power plant pollutants from scores of natural pollutants, or to tell whether a death was caused by pollution or by bacteria, obesity, smoking, diabetes or countless other factors. So to augment its baseless claims, EPA employed illegal experiments on people. But even when its human guinea pigs breathed up to 30 times more particulates than the agency insists are lethal, no one died. Apparently, air pollutants are a health hazard when they come from cars, refineries or coal-fired power plants – but not when they are administered in massive quantities by researchers hired by EPA. EPA gets away with this by having activist groups posing as scientific bodies rubberstamp its pseudo-science. Since 2000, it has paid the American Lung Association more than $25 million, given its “independent” Clean Air Scientific Advisory Committee members over $181 million, and let CASAC deny membership to industry or other experts who might question EPA findings. EPA also wants to regulate all ponds, puddles, creeks, ditches and other “waters of the United States” (WOTUS) that are even remotely connected to a navigable waterway. That way it can control nearly all land uses and family, farm and industrial activities in the USA – based on equally specious “science” regarding supposedly dangerous pollutants that might get into drinking water or wildlife habitats. The junk science really goes into hyperdrive on climate change. Of course, it’s not just EPA. Virtually every Executive Branch agency has been enlisted in President Obama’s campaign to use “dangerous manmade climate change” to justify fundamentally transforming our nation’s energy, economic, legal and constitutional systems: from NASA and NOAA, to Agriculture and Interior, and even the Defense Department and Securities and Exchange Commission. The agenda overrides science and ethics. EPA’s 54.5 mpg dictate for vehicles will force millions into smaller, lighter, plasticized cars that will not survive collisions with walls, trees, trucks and buses – causing thousands more serious injuries and deaths every year. That toll is ignored in the agency’s “social cost of carbon” reports. 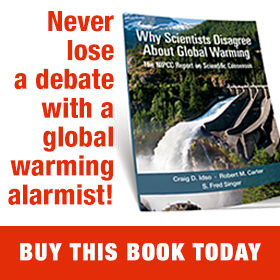 So are the absence of hurricanes hitting the US mainland for 11 years, no rise in average global temperatures for 18 years, followed by a couple tenths of a degree of nature-driven warming since then, and the barely seven inches per century in Real World sea level rise, contrary to climate models and White House, EPA, IPCC and Al Gore assertions. Federal regulations cost US businesses and families $1.9 trillion per year – with EPA alone accounting for $353 billion of that. This is a major reason for America’s anemic 1.1% annual economic growth and its worst labor participation rate in decades. As always, poor and minority families are hit hardest. And far too many of these regulations and costs are based on questionable, fabricated, even fraudulent science. To top it off, illegal, unethical collusion has also become rampant at EPA: in sue and settle lawsuits, Alaska’s Pebble Mine permits, the Clean Power Plan, and helping climate activists with fund raising. If these actions were committed by a private corporation, EPA and Justice Department SWAT teams would come after its executives, with no intent, negligence or knowledge required. But Ms. McCarthy and her staff have not been held to any such Park Doctrine standards – at least not yet. Perhaps that explains why so many DC insiders are outraged (and maybe quaking in their boots) over the prospect that an unpredictable Washington outsider might become the next US sheriff.